This report describes the purpose, method and results of a three-day course on intensive medical care created and taught by members of the Haitian Resource Development Foundation [HRDF], its international partner Association of Haitian Physicians Abroad [AMHE], and staff of Haiti’s Ministry of Public Health and Population [MSPP]. Both HRDF and AMHE have made it an organizational priority to “narrow the knowledge gap” between Haitian health care providers and their counterparts in the modern world on the subject of evidence-based medicine and health care delivery. Both organizations want to see Haitian medical practitioners be able to deliver the best possible care based on proven diagnostic and treatment evidence, accessible from colleges, universities, hospitals and research institutions all over the world. Evidence-based medicine, inherently depending on computerized communications technology, requires much more specialized education and training than previously required by referring to dusty books and local telephone calls. This, in turn, requires capital investment in communications and teaching expertise that is by and large not yet generally available in Haiti. At the same time, there is a continuing gap in intensive care capacity between Haiti and the modern world, i.e. the ability to provide hospitalization and ‘round the close attention and life support to patients with severe acute and chronic conditions. Haiti has lacked this capacity for years. Modern intensive medical care was introduced to Haiti in 2008 by the combined efforts and resources of Haitian Resource Development Foundation, the Association of Haitian Physicians Abroad, Mole St. Nicolas in Action (MOTION) and the United States Southern Command at the Hôpital de la Communauté Haitien in Frères, near Pétion-Ville. National capacity increased early in 2010 when volunteer foreign physicians established some temporary intensive care units in field hospitals to provide necessary critical care to badly-injured earthquake victims. Today, intensive care units [ICU] exist in a few permanent locations in Haiti. There are four beds at Bernard Mevs Hospital in Port-au-Prince, six at the Sacred Heart Hospital in Milot in Haiti’s north, and two at the Community Hospital in Aquin on Haiti’s south-central Caribbean coast. In the near future, intensive care capacity is expected to increase by an additional ten to fifteen beds. The term « bed » of course signifies much more than where the patient physically lies; it signifies all the additional specialized diagnostic, monitoring, surgical, laboratory, treatment, rehabilitation and administrative personnel, knowledge, equipment and supplies needed to keep each ICU patient alive. As part of this effort, and within the framework of its continuing medical education program, HRDF and its partners offered in Aquin, in April 14 -16, 2014, a short-course on intensive medical care to introduce critical care concepts and practices to family physicians and nurses who work in the emergency services in the southern department of Haiti. 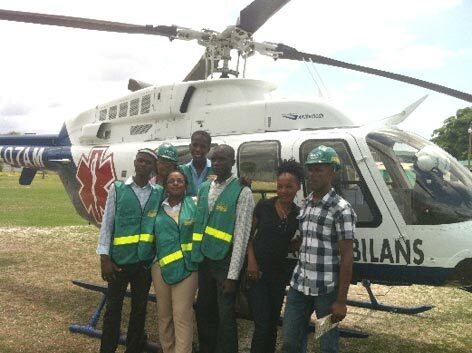 A week later, some of them, participate in a training demonstration cooperating with a new helicopter medical transport service, Haiti Air Ambulance, based in Port-au-Prince. • Learning how to operate ICU monitoring systems and how to analyze the data. - Update of ACLS 2014 guidelines. The students were also given hands-on practice by an AMHE chapter team from Montreal, Canada on the diagnosis and treatment of cervical spine injuries in polytraumatized patients. THE FUTURE – HRDF and its partners acknowledge that the concept and practice of intensive medical care are quite new to this group of Haitian physicians and nurses. More education and training is recommended. With that in mind, HRDF launched a Facebook page in April as a mode of reinforcing communication among instructors and Haitians students. The webpage will provide articles and links to medical literature and offer a chat tool so that practitioners can discuss cases and review reading materials. On a more formal plan, HRDF and AMHE are working together to attract board certified internists and « reanimateurs » to continue to expand the teaching of critical care medicine across Haiti, not limited to the South.